In a perfect world we could just make all of our meals in a mug, take 5 minutes out of our day for the food we consume, and be on our merry way to more important things. 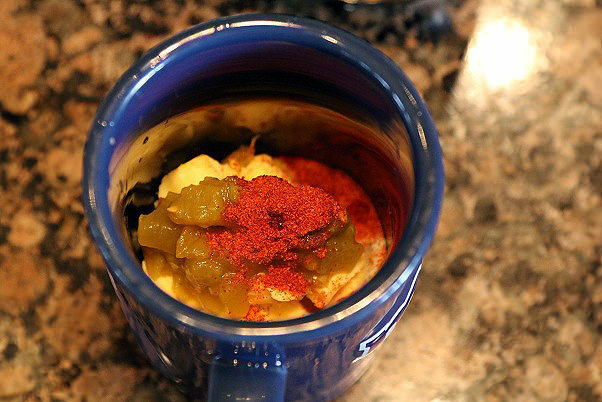 Though, mug cakes won’t always get that craving for meat out of your head, they are still an awesome meal replacement for anyone who’s in a rush. 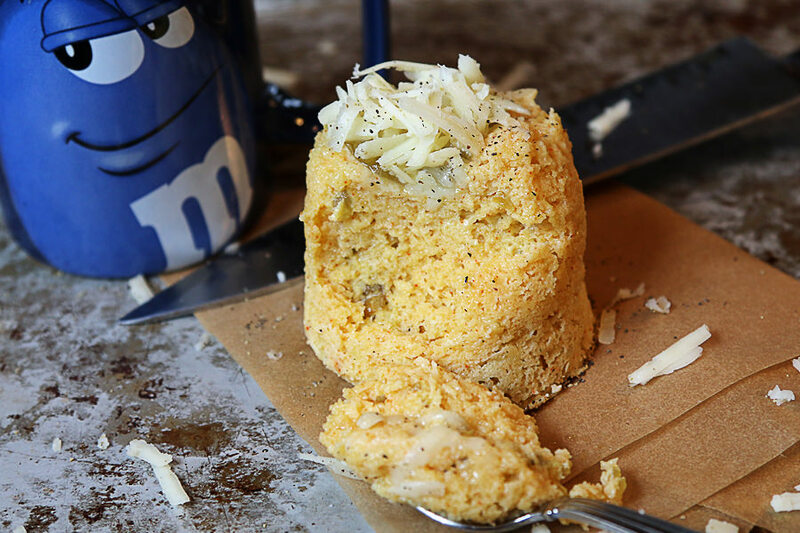 If you missed out on the last mug cake, it was a good one so make sure to check it out. Bacon, Cheddar & Chive – yep, I did that. You can easily pre-pack the ingredients in a bag and take it to work with you for lunch on-the-go. That’s my favorite part about these. No lugging around tuppaware containers full of different leftovers and salads, and no fuss or mess at lunch. Just mix the ingredients, stick it in the microwave, and eat. You can’t beat it, really. 1. Get your mug ready! Alright, I’m using a cup for this one. Add 1 Large Egg, 3 Tbsp. Honeyville Almond Flour, 2 Tbsp. of Room Temperature Butter, 1 Tbsp. Green Chile, and 1/4 tsp. Cayenne Pepper. 2. Add 2 Tbsp. Shredded White Cheddar, 1/4 tsp. Baking Powder, and a pinch of salt. Mix everything together well. 3. Microwave this for 70 seconds on high (power level 10). Then, lightly slam your cup against a plate so that it comes out of the mug (or cup in this case). 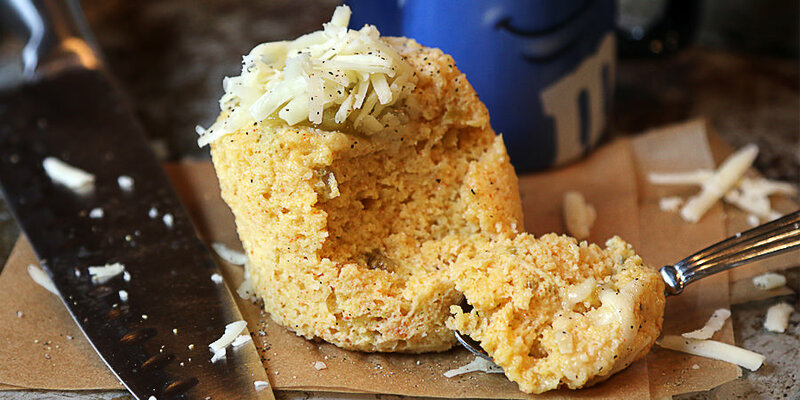 Top with extra cheese and black pepper! Per serving this is 458 Calories, 43.05g Fats, 4.4g Net Carbs, and 14.29g Protein. Of course, you could always split that in half if you can’t afford that many calories! Or, you could replace a whole meal with this – hello new lunch! 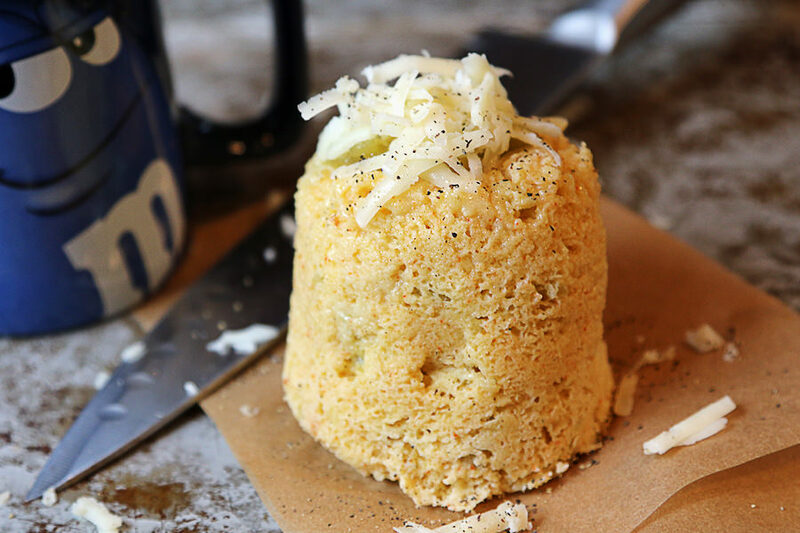 Yields 1 Green Chile Cheddar Mug Cake. Per serving this is 458 Calories, 43.05g Fats, 4.4g Net Carbs, and 14.29g Protein. Microwave for 70 seconds on high (power level 10). Lightly slam cup against plate to take the mug cake out. 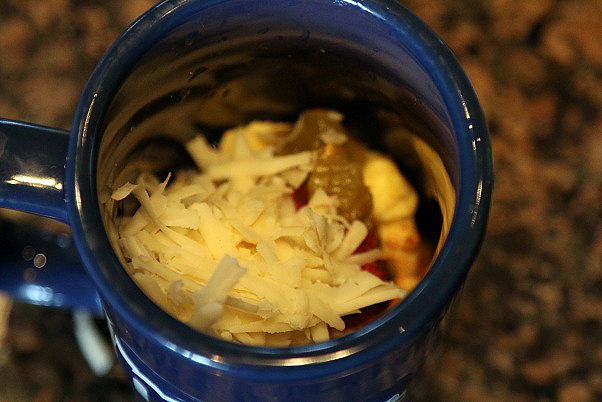 Add extra cheese and some black pepper, then serve!